New Coast Guard boathouse replaces historic structure destroyed by fire in 2010. Following a few delays over the past 15 months, the new Coast Guard boathouse in Menemsha harbor is on track to be finished early next year. Completion of the boathouse was originally expected by this summer and then by Christmas. Brad Linman, a project manager with the M.A. Mortenson Company based in Minneapolis, Minn., said Monday that after some painting and other minor work the boathouse would be ready for final approvals by mid-January. A fire in July of 2010 destroyed the previous boathouse, built in 1938, along with a wooden pier leading to the dock. The cause of the fire was never determined. Congress later approved $10 million for the new boathouse, which includes a boat ramp, locker rooms and indoor spaces for crew members to work on the station’s 25-foot response boat. The station also maintains two 47-foot motor lifeboats. The new structure is fire-resistant with a concrete floor and walls, and can withstand earthquakes and 100-year floods. With its traditional red roof and white walls, it resembles the earlier boathouse, although it has three, rather than two stories. The exterior shingles are cement. Mr. Linman said there were several reasons for the delays, including the challenges of getting workers to and from the site and having construction materials delivered from the mainland. “Getting things over on the ferry takes a little bit more coordination than everybody is used to,” he said. He added that it was somewhat of a challenge to comply with the Buy American Act, signed by President Herbert Hoover in 1933, which requires that government projects favor products made in the United States. After the boathouse is completed, Coast Guard members will be trained on the use and maintenance of the building, which includes composting toilets, a compressor system for pneumatic tools and pipe clearing, three fuel tanks — for heating oil, gasoline and diesel — and an overhead crane. A formal opening for the building is being scheduled and may take place later this winter. In the absence of a boathouse, the station has had to use a boat ramp at Lobsterville, about a mile and a half away, to access its response boat for maintenance. “I would imagine sometime in January we will have full access to the boat ramp at Menemsha, and that will be a great improvement for us,” Mr. Reimer said. Scott McDowell, a member of the harbor advisory committee, said the project has been well received by the public. “I haven’t really heard anyone say anything negative about it,” he said, although he noted some damage to the harbor’s west jetty during construction. The Army Corps of Engineers is expected to rebuild the two harbor jetties this year. The jetty project may include the dredging of the channel, where the tide flows in and out through Menemsha Creek. The building of a new dock for visiting boats, the installation of pilings, and various repairs are also in the works. Navigating the barges, cranes and other equipment through the Menemsha Harbor, especially during the busy summer season, was one of the challenges during construction, Mr. Linman said. “Our concern was to just make sure that everybody was safe, and to attempt to minimize impact to the local businesses and the fishermen,” he said. “But everybody worked really well with us. Is this another example of a building project on MV that is done by an off island contractor, and off island subs using off island carpenters, plumbers, electricians and maybe even laborers? And MV people in these trades, or people who could learn these trades, are in waiting lists for affordable housing. The new Edgartown Library may be another example, as was the Chappaquiddick Fire station where the lightning rods were installed by a firm that drove all the way from upstate New York to do this task that someone like Lee Welsh could have done in a few hours at 25% of the cost. Taxpayers and Vineyard Contractors and trades people should band together to bring the work home. Built to last? 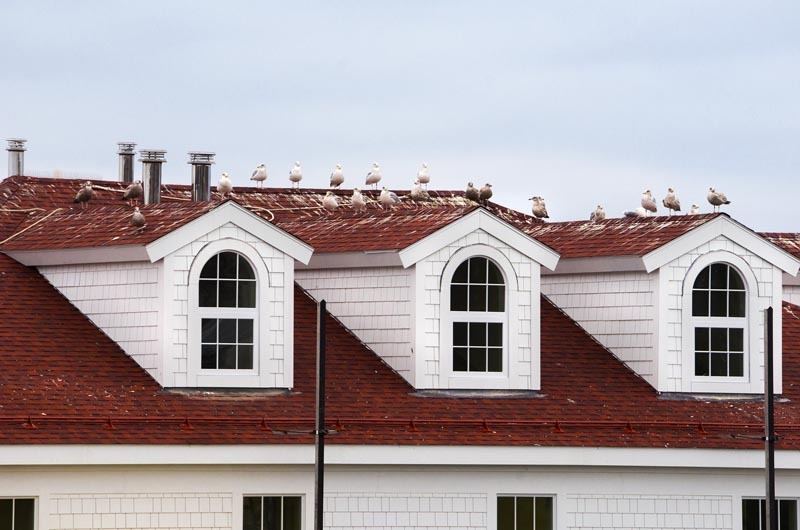 The seagulls sure seem to approve. The on island labor is notoriously expensive, and not the highest quality. If people are going off island there is a reason. And this is not the place to gripe about this issue. The uscg boat house is a national project, they serve the nation, not just mv, be thankful they used a us company. Look beyond your shores, there is a big competitive world out there. Congratulations uscg! Well deserved. Thank you for your service!!!! Why does this work get hired out to people from Away? One word answers the question. Bureaucracy. It's often hard to use local contractors because they lack the bonding and other legal requirements for State and Federal projects. Steve hit the nail on the head......bonding requirements for government contracts are expensive and bonds aren't easy to get. But there is nothing to stop a town or city requiring contractors on public works jobs (i.e. State or Federal gov't) to use a percentage of local labor. The town cannot require the State or Federal government to do anything. They can however require a certain percentage of locals on any local government job. Glad to see that the seagulls have made their contribution to make it look authentic. Five fishermen were stranded on Nomans Land for more than five hours Wednesday, waiting for the U.S.